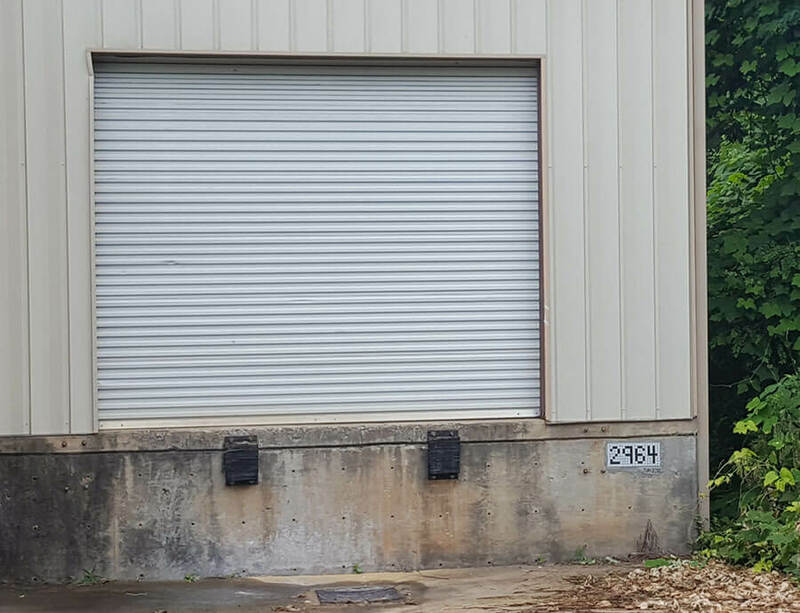 Natalija decided to test some materials and methods by putting our street number on the loading dock of the warehouse. Her method was to lay 3/4-inch vitreous tile in a mounting grid, but she put them in upside down and laid a sheet of fiberglass mesh on them and used one drop of silicone adhesive on each tile to attach the mesh. My method would be to lay the tiles in the grid right side up and pick up the design with mosaic mounting tape. The purpose of Natalija’s experiment was to demonstrate that the silicone adhesive was compatible with thinset mortar and that there wasn’t any problem with the silicone being compressible. That isn’t surprising because thinset mortar can tolerate displacement (movement of the tile) and the GE Silicone II we sell is pretty firm when cured. Nevertheless, I wouldn’t use silicone to mount tiles to a floor, although I am sure some people do, and they do so successfully because they don’t use a thick layer of it. I am coming to accept that much of my resistance to silicone as a mosaic adhesive is due to the fact that people who had problems with it were due to using softer varieties or applying it too thickly. My thinking was that if people are likely to use it incorrectly, it was better to tell people to avoid it all together. Now I see that it has its place, especially for glass-on-glass mosaics where water-based glues like Weldbond might have trouble drying fully. Mosaic Street Number on warehouse loading dock. 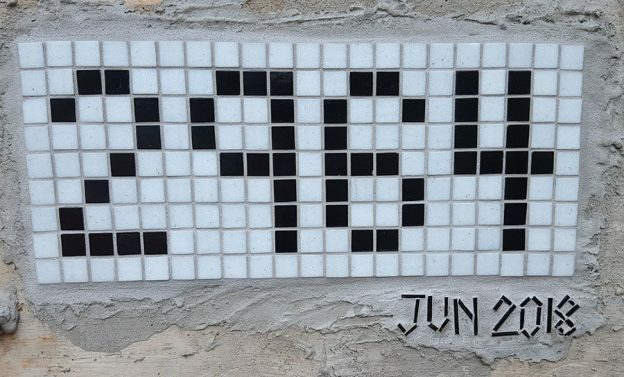 If you would like to make a mosaic street number from tile or pieces of cut tile without a grid, you can do that by drawing a pattern (or printing one from a digital image) and then tiling the pattern using our contact-and-tape mosaic transfer method. Mosaic Street Number. Note how Natalija used Outliners Mosaic Sticks to free hand the date at the bottom. Whether your design is a grid or free-form from cut pieces of tile, you should lay it up in advance on fiberglass mesh or mounting tape and then pressing the sheet into thinset mortar spread with a 3/16-inch notched trowel. Outdoor mosaic can be mounted directly to cement, stone, and masonry surfaces, although you should scour the surface with a steel brush to remove any dirt, paint, or contaminants. If the surface is uneven, such as a brick wall, you can plaster the part of the wall to be mosaiced with thinset mortar a day or two in advance of mounting the mosaic. If your wall is wooden or can’t be mosaiced on for some reason, then you can make your mosaic on an outdoor mosaic backer. This reminded me of my own adventure with street numbers. I decided to create a design to adhere to the curb in front of the house where the number is usually painted in black stencil on a white background. I did the same thing with black and white tile, but before I had attached it to the curb, I was told that tires might scuff against it and either mark or break it. My solution…I have an ongoing mosaic running the length of a white cinder block wall in my front driveway. So far, it’s leaves, grass, roses, butterflies, a hummingbird, and a coyote with gold tile eyes that glow at night. Now that my street address is intermingled with the greenery, along with the 6-inch black wrought iron numbers on my white stucco house, I’m quite easy to find! Hi Carole- I would love to see a photo of your street number installation – it sounds intriguing. I have a sloped surface of my chimney (outside) that I plan to mosaic. I had bought the mesh from you after reading somewhere that I could use it to make my mosaic design on a flat surface inside and then transfer it outside, adhering it in place on the chimney, mesh backer material along with the mosaic itself. Is that not advisable? If I can use the mesh (instead of contact paper), should I use a little bit of thinset to ‘glue’ the tiles to the mesh or the adhesive? Thank you! Thinset mortar is a portland-cement “concrete” product. Use our mounting paper or mounting tape to face mount instead of using mesh.